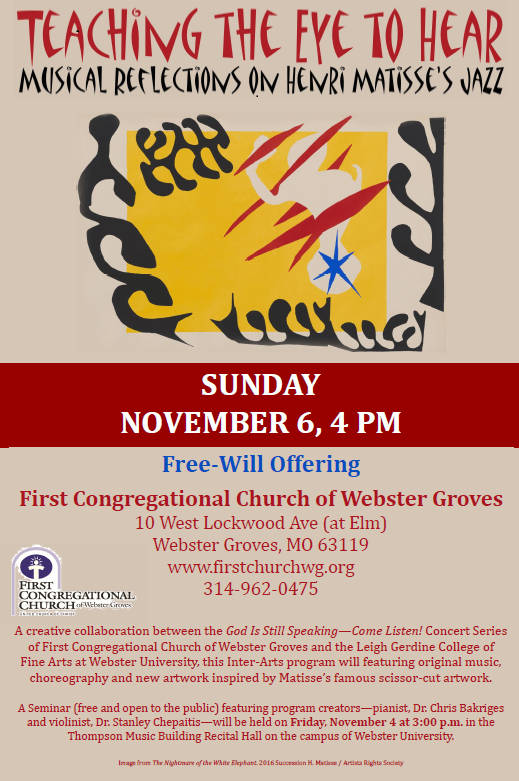 For one fall afternoon, music, dance and art will combine in a collaborative experience at First Congregational Church of Webster Groves that will explore the work of iconic artist Henri Matisse from multiple perspectives. The program is a creative collaboration between the God is Still Speaking, Come Listen! concert series of First Congregational Church, and the Leigh Gerdine College of Fine Arts at Webster University. 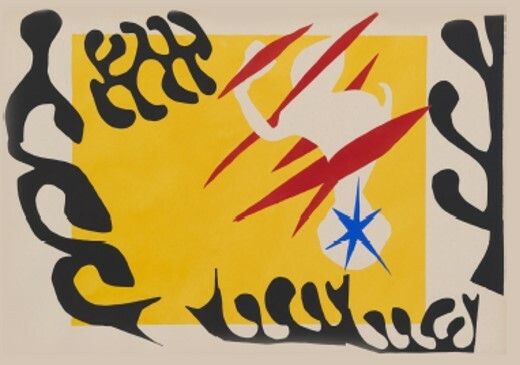 Teaching the Eye to Hear: Creative Reflections on Matisse’s “Jazz” is a multimedia, interdisciplinary arts event featuring original music, choreography and new artwork inspired by Matisse’s famous scissor-cut artwork. The program will take place in the First Congregational Church sanctuary at 4:00 p.m. on Sunday, November 6, 2016. The concert is open to the public and a free-will offering will be received to benefit a refugee student attending Webster University. A seminar featuring the creators of the program and artists from Webster University will be held on Friday, November 4 at 3:00 p.m. in the Thompson Music Building Recital Hall on the campus of Webster University. The Seminar is free and open to the public. Late in life, while struggling with illness and reduced mobility, Matisse was no longer able to paint. As a result, his creative urges found an outlet in another medium: paper cutting. He discovered that, by cutting dramatic shapes from painted paper, he could still create striking new art pieces. Twenty of these were published in a book under the title, Jazz, because of the influence of music on his work, and the spirit of jazz-like spontaneity that infused his creative process. “There are wonderful things in real jazz, the talent for improvisation, the liveliness, the being at one with the audience,” Matisse wrote. That spirit will be cultivated and celebrated during the event. Matisse’s art and writings have inspired the performers to reflect and react across cultural and generational boundaries, and even across various artistic media. The result is a once-in-a-lifetime multisensory experience: The group of artists performing at First Congregational Church of Webster Groves on November 6 will come together only on this one occasion to explore, reimagine and transform Matisse’s experimental techniques. Music will be provided by pianist Chris Bakriges, Ph.D., composer and a lecturer at Elms College and Massachusetts College of Art and Design. Chris will be joined by Stanley Chepaitis, D.M.A., violinist and music professor at Indiana University of Pennsylvania. Dance choreography and original artwork will be provided by faculty and students from the Webster University Fine Arts Department. Audience members will be invited to participate in creating original paper cuttings during the program. Readings will include quotes from the writings of Matisse himself. He completed the full collection of 20 compositions based on the book’s 20 paper cuttings in 2012. Originally intending to perform with his son until a debilitating brain disorder incapacitated the young man, Bakriges performed the work at the 2014 Matisse Exhibition at the Indiana University Art Museum in Bloomington, Indiana, with bassist Jeremy Allen from IU’s Jacobs School of Music. Chris’s work with Chepaitis has brought them into collaborations with artists from other media: dance, language, film and all manner of the visual arts. After all, the project has been interdisciplinary from the start. Pianist and composer Chris Bakriges, Ph.D., teaches at both Elms College and the Massachusetts College of Art and Design in Boston. His doctorate in ethnomusicology at York University in Toronto allowed him to study with the late Oscar Peterson. He has also worked with Jimmy Giuffre, Harold Danko, Anthony Braxton, Billy Taylor, Frederick Simmons and Nadi Qamar. Bakriges is a founding member of Critical Theory Ensemble and Quartet ’Til the End of Time, and played with the Oikos Ensemble. He was music director for the monthly “Jazz Alive” radio program on NPR and has accompanied many artists, including Kenny Burrell, Bernard Purdie, Bobby McFerrin, Elements, David Darling and Dave Holland. His newest recording is Clear and Present with his quartet that features vibraphonist Jay Hoggard, bassist Avery Sharpe, and drummer Billy Arnold. Violinist Stanley Chepaitis, D.M.A., is associate professor of music at Indiana University of Pennsylvania. He holds a doctor of musical arts degree as well as the coveted Performer’s Certificate from the Eastman School of Music. He has studied violin with John Celentano, Renato Bonacini, Carroll Glenn and Raphael Bronstien; he has also studied jazz composition and improvisation with John Blake, Bill Dobbins and Rayburn Wright. He currently chairs the string faculty of Indiana University of PA and is first violinist of the Litton Quartet. Chepaitis has created an innovative, holistic approach for teaching improvisation to string players of all ages and is much sought-after as a clinician. He has recorded three CDs of original works. His latest CD, Double Take, features works by Bach and Telemann alongside original jazz compositions based on those works. When: Sunday, November 6 at 4:00 p.m. When: Friday, November 4 at 3:00 p.m.